SOMEONE posted a link to this story on Jessica's blog and of course, nosy me, I read it. I wanted to throw up my lunch after. So read at your own risk! TOWNSVILLE Engineering Industries (TEI) has denied their employee was sacked for his toilet habits. Company manager Byron Carter said Amador Bernabe's toilet habits had posed a `serious health risk' to his other employees and he had been counselled a number of times about the issue. OKAY, first off, I hope this story doesn't become another heated debate about racism like the inane Desperate Housewives issue, which I thought was stupid and a waste of time. This is a question of public health. This is not the same issue as that Filipino kid in Canada being told to change his eating habits by using a fork and a knife – the supposedly Canadian way – from the Pinoy custom of eating w/ a spoon and fork. The school the child was enrolled in was clearly wrong on that account. The child's eating habit was not endangering anyone. I thought that issue was same as forcing left-handed kids to use their right hand for writing, back in the day when there were many misconceptions about lefties. After reading this story in the Townsville paper, my first reaction was "YAAAK!" I mean who doesn't use toilet paper in this country?! I know Pinoys are the cleanest when it comes to their person it drives other foreigners insane (there was actually a news story about a Spanish or French couple complaining how their Pinoy boarder using up too much water by bathing 3x a day). So if this story about Mr. Bernabe's toilet habits are true, then I'd really like to put it out there that he is an anomaly. I can understand if you're poor, you can't afford to buy toilet paper. But even then, Pinoys will find ways to wipe themselves off, and not just splash water on their bottom. It's as natural as wiping off your sipon when it comes dripping from your nose. Wiping your bottom after you've done No. 2 is not just an Australian custom. It's also a Filipino custom, and medically, the best way to clean yourself. Of course, after wiping, you splash your bottom w/ water. Then wash your hands. I know most people may forget to wash their hands after doing whatever business in the banyo, but how can you not wipe yourself? Most friends know me to be OC when it comes to toilet paper. 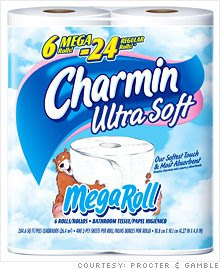 I used to go to the duty-free stores in Clark and Subic regularly just to buy U.S.-made toilet paper which are thick, absorbent, but soft (my favorites are Charmin' and Northern Quilted) and quite cheap compared to the local toilet paper. With the depreciated peso rendering these toilet paper luxuries moot, I am happy with Paseo or Scottissue's Triple Ply. One of my pet peeves is checking into so-called Triple-A resorts or luxury hotels only to find one-ply rough toilet paper in their banyos! Horrors! So you can imagine how this story of Mr. Bernabe truly ticks me off. (UPDATE 3:49 pm:) There is an ongoing discussion right now in my Facebook page about the use of toilet paper. Apparently, there ARE some Pinoys who don't use toilet paper first after doing the No. 2; they wash first, then use the TP. Some of them are even my friends! I may have been living in some other parallel world after all. Now if I managed to offend some people about this post, especially those whose toilet habits are different from mine, then I apologize. That was not my intention. I'll update you guys about this discussion. I'd appreciate comments from you readers as well. ANYHOO, I think Mr. Bernabe should have adjusted to his environment accordingly. It's not as if he had to pay for the toilet paper. If he uses toilet paper anyway after washing, why not just follow the management's suggestion and wipe? He should have also thrown the wet tissues in the waste basket instead of leaving them on the floor. If the toilet bowl was wet, he should have also wiped it dry out of concern for the next person who would be using the cubicle. If the guy was such a slob as reported, then he is a disgrace. When one's personal custom or habit offends other people, then one must change. He can be a slob in the privacy of his own home. (UPDATE 11:55 pm): After much discussion, my friends and I agree, it the guy was just being a slob, then the company was just right to take him to task for it. He should clean up after himself. But if management was just targetting him bec. he uses water instead of TP to clean himself after doing the No. 2, then the company was wrong to fire him. Mr. Poet insists, "why didn't he just use the toilet paper?" Ewan. well people lived healthily before the invention of toilet paper. so i dont understand how such cleaning habits should disgust anyone. sa probinsya po karamihan ang gamit pa rin ay tubig at sabon. kaya nga may tabo sa toilet. nandidiri/nangangati ang karamihan pag tissue paper lang ang ginagamit..siguro dahil hindi sanay. kailangan tubig at sabon at magbanlaw ng maigi. ang pagkakaali ni bernabe ay hindi nya nililinis at pinapatuyo ang toilet pagkataps nyang gamitin.